November 19, 2009 - AirTran Airways reports the company will place advertisement on the back of each seat in all of its 138 Boeing jets. During the next two weeks, each seat will be outfitted with a 2 and 1/2 X 9 inch, easily-changeable, full-color, advertisement screen. This new advertising forum will increase ancillary revenue for the company and joins existing onboard advertising, including: GO, AirTran's award-winning in-flight magazine, seat pocket advertising, advertising on catering items like napkins and flight attendant announcements. 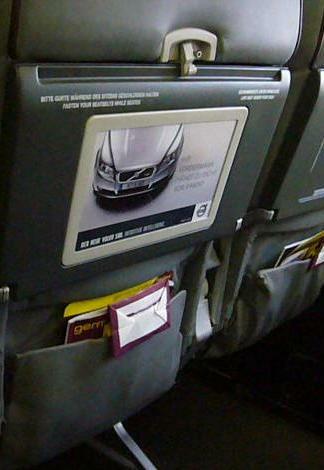 Unlike other in-cabin advertisements, these messages will be fully visible to passengers throughout the boarding, taxi, takeoff, landing, and deplaning phases, offering companies a unique opportunity to reach consumers for periods ranging from a minimum of approximately 40 minutes to several hours depending on the length of the flight. The patent-pending, self-enclosed, advertising system is provided by the OnBoard Media Group an Atlanta-based, aviation media company and is in use by more than 10 airlines worldwide, including Jet Airways in India and Air Arabia in Dubai. AirTran Airways is the first U.S. airline to install this FAA-approved advertising device. AirTran Airways will have final approval of all ads and will ensure offers and messages are consistent with the airline's family-friendly atmosphere. Ads can be changed in just minutes per plane, enabling frequent changes and new messages.